Watch giant Casio has announced that its latest 'smartwatch', the Casio Edifice EQB-500, will go on sale in the UK in September. The EQB-500 was first shown off at Baselworld 2014 in March and will hit British high streets priced around the £300 mark. It packs low-powered Bluetooth 4.0 connectivity meaning that it can sync with the world clocks on your smartphone, allowing smart alarms when you're not in your home country. Now, you may be wondering why we put the word smartwatch in inverted commas in the opening paragraph - after all, it's a word that's obviously a frequent inclusion on the pages of Wareable. The reason is simple, we're not sure the EQB-500 actually qualifies as a smartwatch. We're not arguing that Casio's latest wearable isn't smart, but in a genre that's still to be defined, there are still plenty of blurred boundaries as to what exactly constitutes a smartwatch. It has plenty of connected tech and functions on board, but the lack of a dedicated display and app integration makes it harder to categorise. Unlike its older brother, the G-Shock GB6900AA-1, the EQB-500 also lacks notification alerts from your mobile. Maybe taking the mobile phone market as an example, we should in fact label devices like these, i.e. traditional watch designs with limited smart features, as feature watches in the same way that slightly dumber handsets are labelled feature phones. Either way, it's a category that's bound to expand as the wearable tech market takes off. And it's an area that we at Wareable are massively excited about. The more traditional watch makers that get involved with the connected self, the better. After all, not everyone wants a battery draining OLED display on their wrist that beeps everytime they get an email. 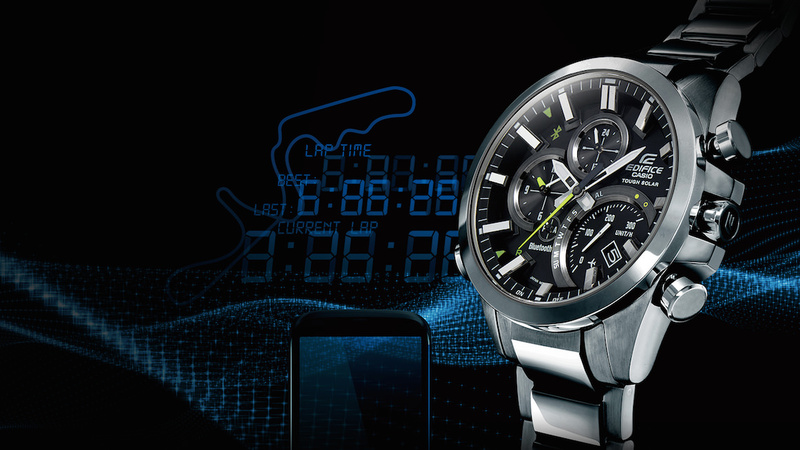 The Casio Edifice EQB-500 will land in Casio's online and offline stores, as well as H Samuel shops, in September. The RRP is £300.